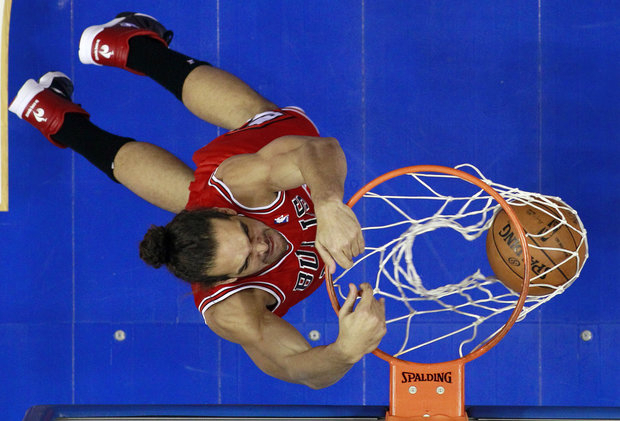 Without Rose, Joakim Noah has elevated his game. Joakim Noah has been playing at a higher level this year. He isn&apos;t a fan favorite outside of Chicago, but Joakim Noah should get some fan votes for this year&apos;s NBA All-Star team. With the voting ending this weekend, it is highly unlikely he will collect enough of those votes to secure a berth on this year&apos;s Eastern Conference starting unit. It will be up to the league&apos;s coaches to give him a spot. The Bulls don’t have the best overall record, like in past seasons, mainly because of Derrick Rose&apos;s absence and the roster upheaval. But the team has played better than most people expected and Noah is one of the main factors. There are several reasons why he deserves a trip to Toyota Park in Houston to play in the NBA All-Star Game on February 17. Opposing teams no longer think of him as a one dimensional player. Assistant coach Ed Pinkney gave an example from Monday&apos;s Cleveland game: "Typically when there is an active front line player (like Joakim), usually one guy takes him , they (Cavs) were all communicating amongst themselves to keep him off the glass," Pinkney said. "He does so many other things, he can make plays for you." The Bulls assistant said Noah&apos;s offense has been "an area of focus"
This year many NBA “experts” expected to see the Bulls struggling, as the team waits for Derrick Rose’s return from his knee injury. Yes, there are times when they lose games to lesser opponents (like Milwaukee on Wednesday). However, once they got used to the new personnel the core players, Joakim Noah, Luol Deng (an All-Star last year) and recently Carlos Boozer (a former All-Star) put the team in position to be in a respectable playoff spot. There should be a reward for this team’s effort and Noah and/or Deng deserve All-Star consideration. If you can only have one Bull, Noah would be a solid choice. How about this reason—he would be a blast to have with the spotlight on him. His energy and ethusiasm for the game is unquestioned.The beauty of a Joakim Noah is he likes to have fun and can be as irreverent as anyone. He will say what he thinks and enjoys the moment. On the NBA All-Star ballot there is no longer a category for centers. There is a listing for front court and back court. Forwards LeBron James of Miami, New York’s Carmelo Anthony and Boston’s Kevin Garnett are the leading vote getters in Noah’s category. Bulls General Manager Gar Forman would love to see Joakim Noah selected to his first All-Star game. “He has been a big part of our success over the year, he is having a real special year and I hope he makes it,” he said. You may wonder why I didn’t talk to Joakim about this. He is one of those players that doesn&apos;t like to speak about his accolades. So it felt best to let the people that have watched him grow and develop give him the boost for a game that he should be a part of this year. From my vantage point there is no question he belongs . If the Chicago fans can’t stuff the ballot box, hopefully the NBA coaches will get it done.